Positively change your life in just 24 hours, one hour each week? Discover your Genius Zone - the road to your own highest mental and physical functioning? Learn how to transfer your athletic skills to your business and personal life? Open the door to endless creativity? If you answered "Yes" to any of the above questions, then you will want to experience one of the Scott Sonnon's and Steve Barnes' amazing seminars! Two of the world's most accomplished men in their respective fields have now teamed up to offer their combined insights on the Path of Life Mastery. Scott Sonnon - International Martial Arts Champion, known around the world as the "Flow Coach"
It would be impossible for one person to accomplish what these two men have done. They have mastered the three aspects of life mastery: a vibrant physical practice, a rich transpersonal community presence, and intrinsically rewarding service careers helping hundreds of thousands worldwide through their collective works. And they have created a method for you to tap into the connection between your physical, family and professional abundance. 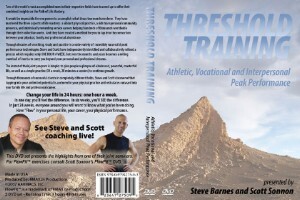 Through decades of searching, study and practice in a wide variety of incredibly successful peak performance technologies Steve and Scott have independently identified and collaboratively refined a process which requires only ONE HOUR A WEEK, but over the months and years becomes a rolling snowball of inertia to carry you beyond your personal and professional dreams. The intent of their joint program is simple: to give people a glimpse of a balanced, powerful, masterful life, as well as a simple practice (3X a week, 20 minutes a session) to continue growth. Through thousands of successful clients in completely different fields, Steve and Scott discovered that tapping into your unlimited potential is anchored in your physical practice and reticulates outward into your family life and professional career. In one day, you will feel the difference. In six weeks, you will see the difference. In just 24 weeks, everyone around you will want to know what you've been doing! Discover Flow...in your personal life...in your career...in your physical performance. Don't have time to go to a seminar? No seminars held in your area? Still want to get a taste of what this seminar is all about? Note: The Treshold Training 2 DVD Set presents the highlights from the latest seminar.